VIBGYOR wanted to celebrate Father’s Day by engaging with its parental fan-base while also involving their children. We ran a social contest that brought the brand, the parents and their children together all at once! We chose to enhance VIBGYOR's social media performance by engaging with fathers and their children to create the following on a pan-India basis. We tapped into the human insight that children love mimicking the things their parents do while also utilizing the observation that parents love to share pictures of their kids! 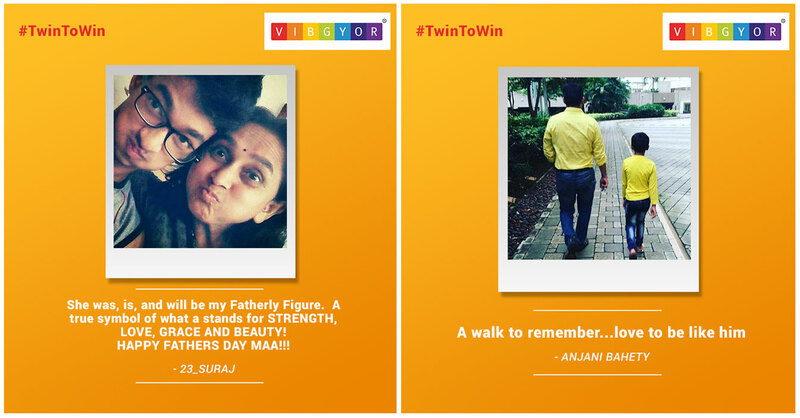 In came the #TwinToWin contest, where we asked dads to take a selfie with their children while they're twinning! Lucky winners were promised Amazon Vouchers to engage participation.